The photos below show a design for a 20W broadband RF transformer for use from 1.8 - 52MHz in a low power amplifier. The transformer consists of two windings, a one turn winding made from thin walled 3.5mm outer diameter brass tubing and a two turn winding wound with PTFE insulated multistranded wire. The core is a two holed (binocular) type, number BN43-0202 and the completed structure is approximately 0.7” (18mm) long. The first photo below shows the low impedance one turn end and the second photo shows the higher impedance two turn end. The brass tubing is soldered to the single sided PC board copper surfaces at each end, filed down smooth and then deburred with counter sink bit. The two turn winding may then be put in place. One of the PCBs has the copper area separated with a small gap, the other PCB copper surface is continuous. PTFE insulation is required to prevent it softening or melting during construction (soldering) and operation. This type and size of transformer may be used to drive a pair of push-pull output devices from a single ended driver or in the collectors/drains of those output devices to drive a single ended 50ohm load up to about 20 watts. At this power level the core may run warm. 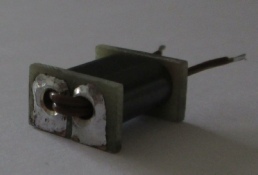 The completed transformer is soldered down on the surface tracks of the power amplifier board and lacing twine or a tie wrap may be used for extra mechanical stability. To ensure a good fit on the motherboard the lower endges of the two end PCBs on the completed transformer should be parallel which can be achieved using a fine file at least as wide as the PCB cheeks. The bandwidth should be adequate to cover 1.8 - 52MHz with a single parallel compensation capacitor on each collector/drain winding. Two of these transformers were connected back to back with a single compensation capacitor and showed a frequency response of 1.5 - 55MHz at -1dB and a midband insertion loss of 0.8dB. Without the compensation capacitor the HF end reached 76MHz but there was a midband dip of at least 1dB. Higher power transformers will require a larger core and possibly different turns ratios. Designs are available on the Internet up to at least 2KW. Power levels up to 100W are possible with the correct sized core and a 13.5v supply. Power levels above 100W are best implemented with 28v or 50v supply devices and may also use multiple amplifiers and combining transformers. If you prefer to buy this type of transformer ready made there are a number online suppliers - just Google ‘broad band transformers’.